What is it with the connection between Herr Biden and car accidents that kill people? A Bernalillo County Sheriff's deputy escorting Vice President Joe Biden's motorcade was hit this afternoon at Gibson and Carlisle. Police say a woman drove around two police units blocking the intersection and hit a car driven by a sergeant with BCSO. No injuries or arrests have been reported, but the sergeant has been taken to Presbyterian Hospital for evaluation. A sheriff's spokeswoman would not say whether the vice president had already gone through the area at the time of the accident. Two armored U.S. Secret Service vehicles, including a limousine sometimes used by Vice President Biden, struck and killed a man hours before dawn Wednesday as he was crossing rain-slicked Suitland Parkway near the District-Maryland border, authorities said. The pedestrian, whose name was withheld by police pending notification of his next of kin, was struck by the limousine and a Chevrolet Suburban at 2:27 a.m. at Naylor Road, just over the District line in Prince George's County, according to the Secret Service and U.S. Park Police. Biden had used the limousine Tuesday during a visit to Fort Lewis, Wash., and the Suburban had also been part of the vice president's motorcade during the trip, Wiley said. Authorities said that a tractor-trailer hits the BMW driven by Jill Biden, wife of U.S. senator Joe Biden, on southbound I-95 south of Delaware 141 at around 9:45 a.m. when the tractor-trailer changed lanes and injured her. According to Delaware State Police Corporal Jeff Whitmarsh, the Maryland tractor-trailer driver, Duane Vanderbosh, of Perryville, was driving a 1988 International tractor-trailer south in the left center lane of the highway next to the BMW being driven by Jill Biden, of Greenville. As the rig changed lanes to the left, it hit Mrs. Biden's car. Jill Biden was injured to some extent and taken to Christiana Hospital, where she was treated for minor injuries and released. ...eerily similar to the death of Biden's first wife, Neilia. Herr Biden, meanwhile, still tells the same falsehood today that he told 30 years ago...that his wife was killed by a drunk driver. OH NO SHE WASN'T! Watch out! Get out of the way! Joe's driving or here comes his motorcade! What is it with Herr Biden and auto-related deaths? I thought we put auto-related deaths to rest after Fat Ted Tumor Head Kennedy got a first-class ticket to Hell? 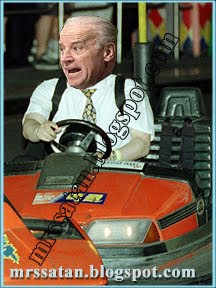 Is Herr Biden taking up the Fat Dead Ted Tumor Head Kennedy Legacy of killing people with automobiles? It certainly looks that way. Bidencide? Or maybe Herr Biden is having these people killed, only he's making it look like a car accident? I mean, if Bush and Cheney can mastermind September 11, who knows if Biden is killing people under the guise of it being an "auto accident?" More murderous crimes against the innocent by the Administration of the O. It will not stop until the supermax is full of Leftardocrats. And it happened yet again with Biden's motorcade a day or two after the most recent "accident." I'm convinced Biden is intentionally killing people with his cars and motorcades. Once is a accident. Twice is a coincidence. But what...four, five times? It's a pattern, a PATTERN I tell ya, a pattern!